Are we all living in the Anthropocene? 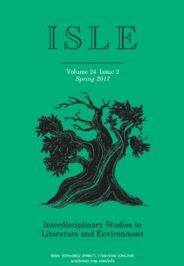 ISLE is a journal of ecological literary criticism and environmental writing. It seeks to explore the relation between human beings and the natural world. ISLE publishes literary criticisms, poetry, fiction, and literary nonfiction relevant to its thematic focus. In 2000, atmospheric chemist Paul Crutzen and biologist Eugene Stoermer published a short but enormously influential article in Global Change Newsletter. In it, they proposed the adoption of a brand new geological epoch: the Anthropocene. Their argument: humans have had and will continue to have a drastic impact on the planet’s climate, biodiversity, and other elements of the Earth system, and the term “Anthropocene” – from the Greek anthropos, or “human” – most accurately describes this grim new reality. Therefore, they concluded, the Anthropocene should officially supersede the Holocene, a relatively stable 12,000-year period following the most recent ice age. In 2016, the Anthropocene Working Group, comprised of an international group of scientists, submitted a proposal to formalize the term as an official unit of geological time. For many, the idea of the Anthropocene seems reasonable. Scientists have found it useful as a way to explain oddities like plastiglomerate, a rock-hybrid substance found on a beach in Hawaii in 2006. The result of plastic garbage melted down by wildfires, lava flows, or ocean vents and fused with rock and sand particles, plastiglomerate fits neatly within the Anthropocene narrative outlined by Crutzen and Stoermer. Moreover, the idea of the Anthropocene continues to attract attention across academic disciplines and in popular discourse and has become something of a meme. The Anthropocene animates discussions amongst environmental humanists, working in fields like philosophy and literary studies, committed to exploring human value systems and motivations that have contributed to current planetary crises. Beyond academia, it has become a trendy issue in environmentalist and political circles, serving as a thematic topic for international seminars such as the UN’s Rio+20 Summit, as well as scientific and environmental journalism, appearing in outlets such as Smithsonian Magazine and NPR’s TED Radio Hour podcast. For some, the idea of the Anthropocene is flattering, suggesting that as masters of our universe, we’ll geo-engineer ourselves out of climate disaster. For others, the Anthropocene amounts to the horrifying realization that “we are the meteor,” destined to doom ourselves through overzealous consumption of the planet’s finite resources. “Grandpa” by Herriest. CC0 via Pixabay. Not everyone, however, has warmed to the newly-proposed epoch. Here’s why: as a concept, the Anthropocene operates under the assumption that the human species as a whole is responsible for potentially irreversible environmental catastrophe without acknowledging that some (read: industrialized Western societies) are far more responsible than others (developing nations, indigenous peoples) for rising carbon emissions, ocean acidification, industrial pollution, and the like. Moreover, the Anthropocene is, by default, anthropocentric – in other words, it puts the human species on a pedestal, portraying it as a supreme agent of change. This is arguably how we got here in the first place: certain groups of humans – particularly those committed to advancing colonial, imperial, and capitalist agendas – have long sought to “conquer” or “tame” nature in pursuit of wealth and driven by a deep belief in the superiority of the human species, especially certain “privileged” groups (read: white, Christian, male). Because of these features, the Anthropocene does not necessarily resonate within indigenous communities, many of whom are disproportionately affected by climate change and environmental injustice. As scholar-activists like Joni Adamson, Kyle Whyte, and Giovanna Di Chiro point out, because many indigenous communities view the world as non-hierarchical, a network of humans and nonhumans deserving equal rights and protections, the Anthropocene at times remains peripheral or absent from indigenous-led environmental and climate justice movements. The concept of the Anthropocene does not fit neatly within indigenous knowledge systems organized around interdependent relationships among humans and nonhuman plants, animals, and ecosystems. Instead, indigenous activists continue to successfully pursue political and legal reforms that recognize these knowledge systems, such as Bolivia’s adoption of the Law of the Rights of Mother Earth (2011) or the Universal Declaration on the Rights of Mother Earth ratified at the People’s Assembly on Climate Change in 2010. In March 2017, Māori peoples of New Zealand won legal recognition for the Whanganui River. By law, the river must be treated as a living entity with the same legal rights as a human being. This marks a huge victory for the Māori, who view themselves as one with and equal to their natural surroundings. Later this year, Hindu groups attained similar legal status for India’s Ganges and Yamuna Rivers, too. So, what does this mean for the Anthropocene? In the very least, it affirms that not all of us are necessarily living “in it,” and that geological time is but one way of understanding and approaching the current climate crisis. It is merely one tool in the toolbox, so to speak, and should be considered alongside other scientific, political, and imaginative means of engaging with climate change. And I’ll end with this: it is the imagination, channeled through literature and art, that I find the most democratic, and therefore the most promising, tool in the toolbox. From recently popularized genres like climate fiction, or “cli-fi,” to novels, short stories, poetry, and film from multi-ethnic and indigenous writers and artists like Karen Tei Yamashita, Linda Hogan, and Juan Carlos Galeano, we are able to explore (and question) a wide range of thought-systems and concepts, including the Anthropocene, that enable us to imaginatively cope with an increasingly unpredictable climate in ways that are socially just. Featured image credit: Untitled by Andre Cook. CC0 via Pexels. Matthew Henry is a PhD candidate in English and Environmental Humanities at Arizona State University. He is the author of “Nonhuman Narrators and Multinatural Worlds” featured in Interdisciplinary Studies in Literature and the Environment. He has a co-authored chapter forthcoming on teaching climate fiction, multi-ethnic literature, and environmental justice in Approaches to Teaching the Works of Karen Tei Yamashita (MLA, forthcoming 2018). He has also published short fiction in Everything Change: An Anthology of Climate Fiction and High Country News. Follow him on Twitter @MenryAZ. Thank you for this, Henry. Nature does not consider whether you are responsible for climate change and other forms of environmental degradation in the Anthropocene. Thus, if we acknowledge that we are in the Anthopocene, we are all there together. Responsiblity is something that we humans must sort out together. We in developed countries bearing the main responsibility must pay our climate debt and help those who will bear the main cost of climate change despite their limited responsibility. But perhaps, we need a more inclusive interpretation of the concept of the Anthropocene, so that it can accomodate indigenous communities as active creators of their own biodiverse surroundings. 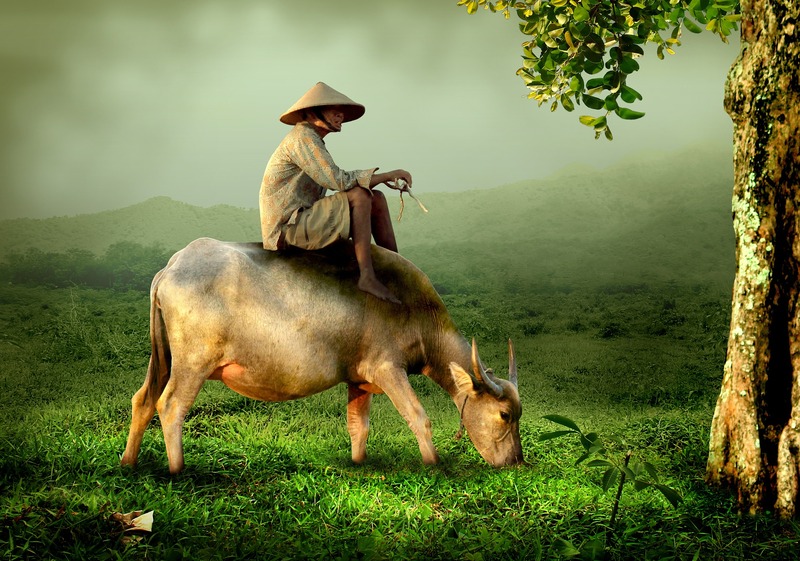 Numbers of indigenous people living a traditional lifestyle are small compared to the numbers of people living in industrialized societies, which do the most damage to Earth. The term “Anthropocene” is perfectly suited to a period when the most spectacular concern of sane people is deterioration of the entire Earth System created by those industrial societies. Trilobites weren’t the only species living in the Ordovician Era, but they’re the easiest to identify and provide probably the biggest selection of fossils of the period. Because indigenous people still live in isolated pockets of nature, which has also been contaminated by industrialization, does not invalidate the term. I think that designating the time we are living in as a new geological and ecological age is a bit of a conceit. I’m am certainly open to the idea but this determination should be made at some remove from our own narrow view. It’s compelling for a contemporary race to put a name on a phenomenon of this magnitude. Kind of like discovering a new species only on a much grander scale. It allows for books and journal articles to justify one’s view, which promotes one’s professional and financial self interest. (Not to mention naming it after ourselves.). Let’s wait a few hundred years to let nature take its course and see how things look from a more objective perspective. Thank you.